The Scorpion VX-R70 is the big brother to the VX-34. It has an intermediate head shape with a new shell, called TCT, which is tri-composite and results in a lighter, stronger shell. A size medium helmet weighs in at 3.1 oz. Most of the tried and true features you'd expect to find in a dirt helmet from Scorpion exist in the VX-R70: kwickwick liner, and the AirFit system means you can pump up your cheek pads for a custom fit. A tool-free grill can be popped out and easily cleaned. The larger eye-port increases your field of vision. Three new air scoops above the brow and below the visor vent lots of air. 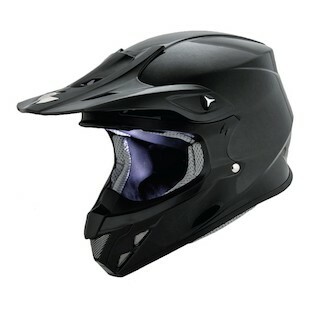 This helmet is available in black and in two different graphic versions, the VX-R70 Fragment and the VX-R70 Flux.